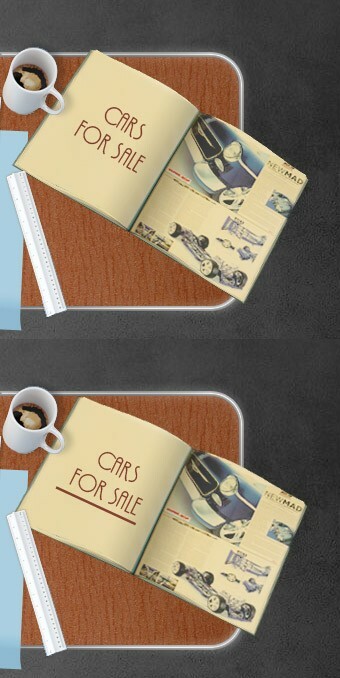 This car has been SOLD. 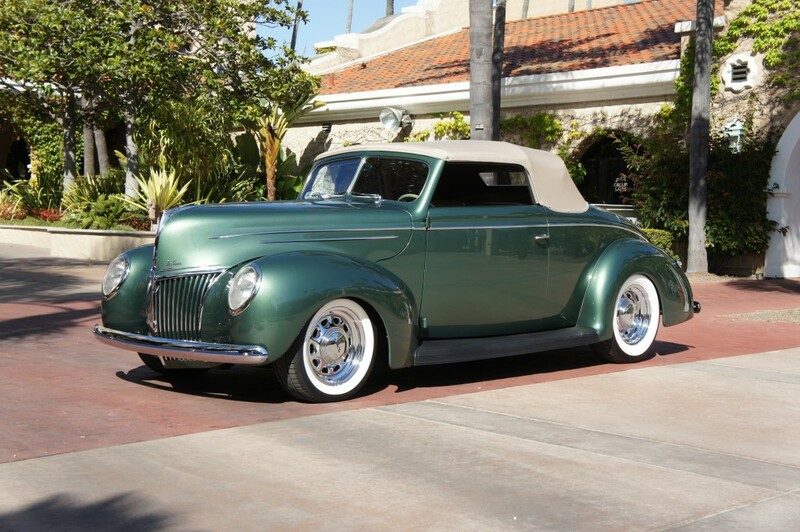 This is a classic 1939 Ford Convertible which has undergone a “body off” no expense spared very thorough mild custom restoration. The top has had a nice subtle “chop” added to it. 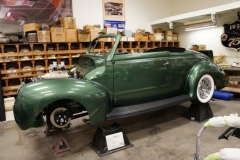 All 1939 Convertibles came with a rumble seat in the trunk area, but we couldn’t leave this one alone, so we turned it into a “rare” trunk model 1939 Convertible. Then a little head scratching and we came up with a unique wheel treatment which involves mid 30’s MoPar wheel centers and traditional outer rims with MoPar hubcap bases and altered Ford hubcap skins attached. Tire sizes for the fronts are 215/60X16 and the rears are 235/70X16. 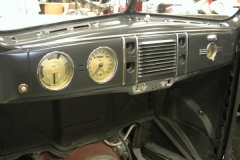 The car has Vintage Air A/C and the gauges are custom gauges by Classic Instruments in the 1939 Ford style. 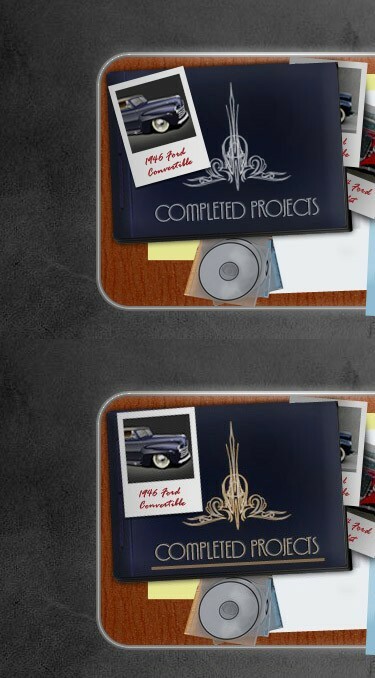 Tail lights are genuine 1937 Lincoln Zephyr units, not the cheaper LED units on the aftermarket today. The steering wheel is a Ford style banjo wheel. Wired onboard is an inline battery tender. The car also has a new California Car Cover . All chrome was redone at Sherm’s Custom Plating to a show quality finish. The backside of the stock bumpers are finished as perfect as the front sides. 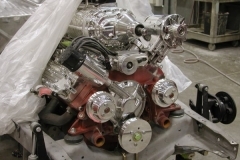 For a power plant we have a flathead V-8, a blower, and a really “kool” Autotrend fuel injection system in “look-a-like” carburetor housings wih a hand formed “one-off” bat wing style air cleaner. 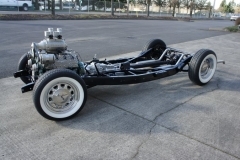 You can float through the gears with a brand new Tremec 5 speed manual transmission and transfer the power to the rear wheels with a bullet proof Ford 9 inch rear end. The car was painted in a stunning altered Aston Martin green. 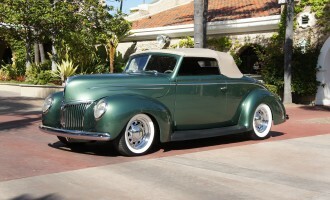 The interior was done by master stitcher Sid Chavers in leather with a touch of mid 50’s Lincoln brocaide cloth inserts. 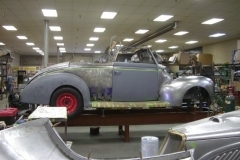 Since this car has evolved into being a dual purpose car, a short term showable car and a longer term reliable “stand tall” driver it was decided to shoot the bottom of the body with a paintable undercoating and sound deading material, then paint it body color. This car trophy’s everywhere it goes. 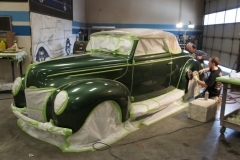 Click into the “galleries” sections below for numerous pictures of the build process showing all of the components used in the build. 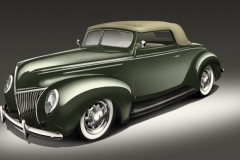 This jewel can be purchased for 25 cents on each dollar spent to build the car. The asking price is $175,000. You can’t find a better one with the eye appeal that this car has.